A large amount of people fear the sitting in the dentist's chair. This fear has nothing to do with a person's personality since even the bravest ones often have this phobia. The smell, the overall atmosphere and the very knowing that soon enough dental agony will start prevents many from enduring this process bravely. Moreover, some even avoid visiting the dentist and suffer from teeth decay rather than facing their fears. For these, and many other reasons, the dentists themselves have come up with quite an extraordinary solution. Namely, if pain and anxiety are you primary worries connected with the dentist's chair, perhaps removing them would make you more keen on worrying about your dental health. Bearing this in mind, some dentists have introduced interesting innovations. While numerous dental ordinations still practice traditional approaches, more and more have decided to provide their patients with an anti-anxiety pill, making them relaxed and prepared to happily endure all that their dentist has in store for them. Patients who are given this pill are not completely sedated. Rather, they are capable of communicating with their dentist without feeling any pain and discomfort, even when more serious procedures, like removing one's wisdom tooth, are performed. The patients find themselves in a sort of semi-conscious limbo, where they feel no negative sides of the dentist's work, while being conscious enough to be aware of the process. Therefore, all who refused to go to the dentist because they feared pain and discomfort, know that most of them nowadays can make your whole experience different. Namely, once all the obstructions between you and the dentist have been removed, there is nothing preventing you from enjoying your perfect oral health. Moreover, a calm patient makes the whole situation incomparably easier for the dentist him or herself. 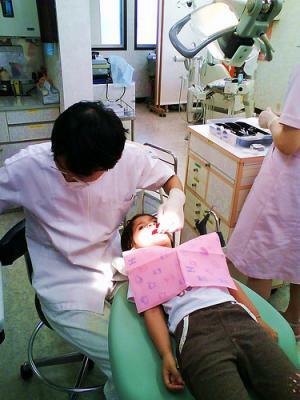 Thus, not only is the patient relaxed, but the dentist as well since, he or she does not need to fear that anything will go wrong. This only means that the job itself will be done better and that everyone will be satisfied. To conclude, this incredibly innovative approach may save one's teeth from yourself, since his or her fear and insecurity often caused their decay. Now, with the miracle of sedation dentistry, you will enjoy the excellent dental health, with only pleasant memories related to it. All you have to do is pay your dentist a visit, chat with him or her a bit, and go home with your perfect teeth, looking forward to meeting him or her again. Gums are swollen and growing in between teeth? Could I remove my braces earlier that I'm suppose to?